It was with nervous trepidation that I took the extra time on March 31st to pick up the new Queensryche album, American Soldier. On the drive to GrayWhale CD Exchange, I, a long time fan of the band crowned “the thinking man’s metal group” found myself wondering what to expect from the veteran rockers who seemed to have lost their way over the past few years. It can be argued that Queensryche never truly recovered from the departure of founding guitarist Chris DeGarmo in the late-90’s. To fans who follow the prog-rockers every move, it was clear that DeGarmo’s genius influence on music and lyrics made the band what it was – a harmonious blend of metal and lyrical presence that demanded more from its listeners than any Heavy Metal band had ever, and arguably would ever, demand. Geoff Tate’s lyrical ability is almost as strong as DeGarmo’s but albums have been lacking since his departure and many have felt that part of the band’s soul is missing. The past ten years have produced interesting and underrated albums, all of them good (if not great), but all of them feeling almost-complete and unsure about the tone and direction. Gone were the power house riffs from classics such as Operation: Mindcrime, Empire, and Promised Land. Even celebrated albums such as Tribe and Operation: Mindcrime II brought Queensryche onto much more classic prog-rock footing, despite guitarist Michael Wilton’s ability to make just about any chord sound metal. When I made it home after my trip to the local CD exchange, I popped open the liner notes and scanned the lyrics. Instantly, my stomach dropped. Despite having already heard “If I Were King” before purchasing the CD, I found myself confused by the fact that the majority of the songs were not complete Queensryche efforts but instead written by Tate and album producers Kelly Gray and Jason Slater (long time Queensryche collaborators.) Only two of the songs included writing credits for band members other than Tate. Okay, I thought to myself. I’ll see what they give me. As for Queensryche, something clicked with the band this time around. 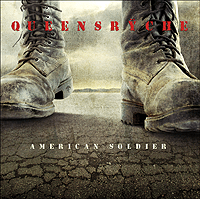 American Soldier is territory familiar to Queensryche and their fans – a concept album. But this time, instead of a fight against the drug and corporate overlords that truly rule America, it is an honoring of the soldiers who have fought and died for America. Whether you are a pacifist or a hard-line supporter of the United States’ military efforts, there is no mistaking the human element of what war does to a person and to his or her family. Full of personal stories from veterans and soldiers currently serving, American Soldier brings us a different side of war. This time, we view it through the eyes of the vulnerable but brave men and women who volunteer for their service while those of us who stay home pray we will never have to be drafted again. And it is clear that Tate, a son of a military family, has a very personal stake in this recording. The twelve song collection is the hardest Queensryche has been in a long time and the familiar bass lines and guitar riffs make it clear that Michael Wilton and Eddie Jackson had more influence with the record than the liner notes would indicate. Yet, even with the rougher edge, American Soldier solidifies the mellower, jazzier sound that has been in development since 1997’s Hear in the Now Frontier was released. Now perfected, it is a sound that works for them. Their talent and ability to blend metal and prog together keeps them distinct amid the mess of monotony that is the rock world at the moment. Despite age having caught up with Geoff Tate, the band has crafted a sound that fits his still impressive range and vocal style. It is impossible to isolate just a few highlights in this collection, although “The Killer”, “If I Were King”, and “Man Down!” count among the most powerful on the CD. With lyrics that do not apologize for acts made during combat, that plead for the resurrection of fallen soldiers, and that face certain death, each track on the album leaves you shivering. The opening track, “Sliver” drop-kicks the listener into boot camp while “Home Again” is a touching ballad that features Tate’s daughter Emily on guest vocals, as a child who sings about her wishes for her father to come home. The band is also not afraid to bring the topic of God into the conversation – after all there are no atheists in fox holes or in the current political fight that has killed over 4,000 American soldiers in Iraq and Afghanistan. But most powerful of all are the words of the soldiers, read before, during, and after the tracks. They are harsh, honest words that give us a glimmer of the truth of what are soldiers have lived and are living through. As with most Queensryche albums, the lyrics drive the music. The songs, inspired by conversations with current and veteran soldiers, force us as a nation to face the questions we often refuse to ask ourselves about the realities of war. It gives us faces for the names on the Vietnam Memorial. It adds a musical note to our grandfather’s World War II stories. It makes us go back and read that email from our friends who are stationed in Iraq. And it reminds us that each man and woman who makes the choice to salute is making a choice to leave behind an entire world that we in this country often take for granted. Until March 31, 2009, Queensryche had been depending on the cult hit, Operation: Mindcrime to gather its fan base. Finally giving into the fans three years ago, the group released the sequel to the classic story, giving the masses what they wanted – information about what happened to Nikki and Mary. While one of the strongest of the last few efforts, Operation: Mindcrime II suffered from the same problems as previous releases and without the other half of the Mindcrime storytelling team, much of the soul was lost. 2007’s Take Cover was a valiant and experimental effort of cover songs with everything from Jesus Christ Superstar to Italian opera being covered in the mix, but it too felt incomplete and wanting. Perhaps, many Ryche fans were thinking, it was time to let it go. Perhaps our heroes needed a rest. Perhaps it was time for them to turn to new projects and wait for the lyrics that had always been ahead of their time to be discovered by the next generation. And then, March 31st, 2009 happened. For Queensryche, it goes to show that they are at the top of their game when creating characters for their operatic lead singer. Considered one of the best bands at creating a concept album, Queensryche is at its best when an album tackles a specific idea or thread and then brings it to the American public. And American Soldier is quite simply their best effort in over a decade. While not as subversive as Operation: Mindcrime, as polished as Empire, or as internally soul searching as Promised Land, it is gut-wrenchingly honest in its message and is equally as thought provoking. Once again, Queensryche is at the top of the heap when it comes to “thinking man’s metal.” Perhaps it’s finally time we named that genre after them.